SDCC 2015: Nighttime Events with CBLDF! Graphic novel superstar Raina Telgemeier, the best-selling author of Smile, Sisters, and Drama, is coming to the San Diego Central Library in downtown San Diego, on Tuesday, July 7 at 6:00 PM for “An Evening With Raina,” a free event to help you get ready for Comic-Con International! Come hear her talk about her mega-popular all-ages graphic novels. Bring your questions and find out what’s next for Raina at this special event presented by Comic-Con International and Comic Book Legal Defense Fund, in conjunction with the San Diego Public Library. Raina is a global phenomenon! Her three books, Smile, Drama, and Sisters—along with her four books based on Ann M. Martin’s The Baby-sitters Club—total a staggering 3 million copies in print, placing her at the forefront of the children’s graphic novel boom. The writer/artists just celebrated her third straight year on the New York Times Bestseller list! Her efforts to champion kids’ right to read include speaking out for Banned Books Week, the annual celebration of the freedom to read. Banned Books Week 2015 celebrates Young Adult books, and the rights of young readers everywhere to read fearlessly! This popular comics creator is a special guest at Comic-Con International this year, but you don’t have to have a badge to see her in this special early appearance at the San Diego Central Library! “An Evening with Raina” is co-sponsored by Comic-Con and the Comic Book Legal Defense Fund, on Tuesday, July 7 at 6:00 PM in the Neil Morgan Auditorium, located at 330 Park Blvd., in downtown San Diego. Admission is free, but seating is limited for this special event. CBLDF will have books available for donations. Our friends at the Library have set up a Facebook page for this special event. Please visit it at https://www.facebook.com/events/409652992554989/ and let us know if you’re going to join us on Tuesday, July 7th for this very special evening! Meet Great Creators! Every year the greatest creators in comics drop in at the CBLDF Welcome Party. Confirmed attendees so far this year include Scott Snyder, Jock, Jeff Lemire, Kieron Gillen, Fábio Moon, Gabriel Bá, Tim Seeley, Ben Acker, Ben Blacker, Joshua Williamson, and dozens more who are expected to drop in over the course of the night! Smell Awesome at the Black Phoenix Alchemy Lab/Trading Post! Black Phoenix Alchemy Lab will be debuting their Profanities series, with a selection of limited edition Expletives that will only be available at the CBLDF Welcome Party. 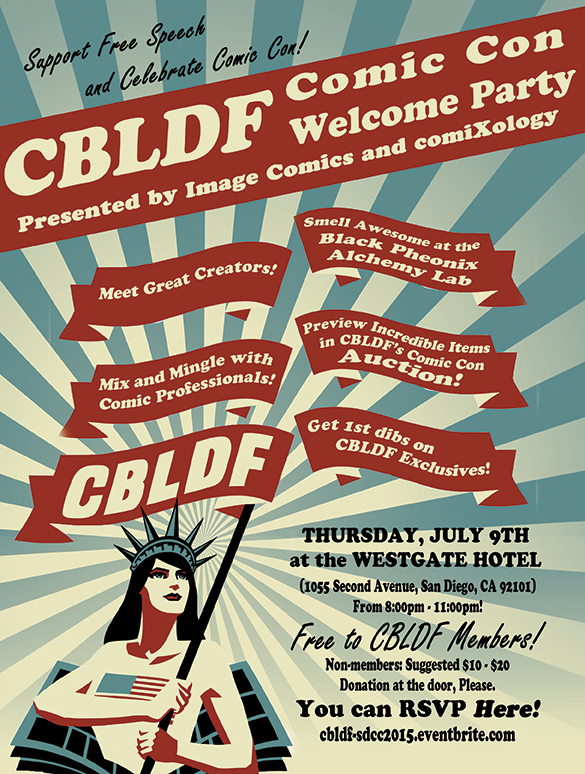 Proceeds from every sale at the CBLDF Welcome Party benefit CBLDF! Get First Dibs on CBLDF Exclusives! CBLDF has been working hard to put together an exclusive assortment for Comic-Con attendees! We have an all-new tote bag featuring art by the terrific Vanesa R. Del Rey (Hit); an embroidered Comic-Con souvenir patch and new CBLDF t-shirt, both designed by Brian Wood (Starve); and the CBLDF-exclusive variant of Star Trek Green Lantern from IDW Publishing and DC Comics! Preview the Incredible Items in CBLDF’s Comic-Con Auction! 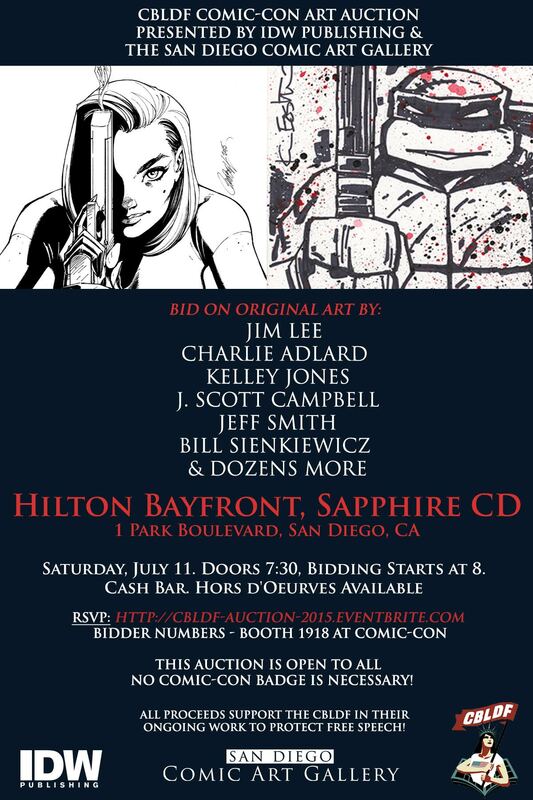 Get a first look at the amazing original art up for grabs at Saturday’s CBLDF Comic-Con Auction, including pieces by Jim Lee, Kelley Jones, Jeff Smith, Matt Kindt, Gilbert Hernandez, J. Scott Campbell, Herb Trimpe, Jeffrey Brown, Greg Ruth, Ray Fawkes, Tyler Crook, and many, many more! Get New Neil Gaiman Art From Neverwear! Neverwear has an ever-growing line of items based on the works of author Neil Gaiman and is an ardent supporter of CBLDF! Neverwear will support the Fund at the SDCC Welcome Party by premiering “Hope,” a new print by Chris Ridell, along with classic designs by David Mack, Jim Lee, Olivia, and Jouni Koponen. 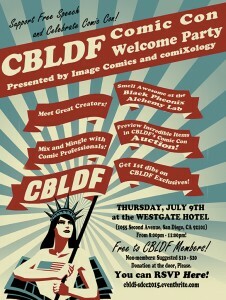 Proceeds from sales at the CBLDF Welcome Party benefit CBLDF! 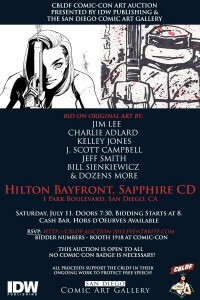 IDW Publishing and San Diego Comic Art Gallery proudly present the Comic Book Legal Defense Fund’s Comic-Con Art Auction on Saturday July 11 at 8:00 PM! Bid on original art by some of comics’ greatest creators, including Jim Lee, Charlie Adlard, Kelley Jones, J. Scott Campbell, Jeff Smith, Stuart Immonen, Tula Lotay, Dan Brereton, Sam Kieth, Ming Doyle, Bill Sienkiewicz, Paul Pope, Matt Kindt, Gilbert Hernandez, Jeffrey Brown, Greg Ruth, Fabio Moon, John Livesay, Gabriel Ba, Tyler Crook, and dozens more! Plus, IDW is opening their vaults to provide rare, signed, or out of print items including Artist Editions and IDW Limited editions that feature Stan Lee, Kevin Eastman, Herb Trimpe, Roy Thomas, John Romita, Gerry Conway and more! All proceeds from this auction benefit the First Amendment legal work of the Comic Book Legal Defense Fund. Your bids should be delivered to Betsy Gomez (betsy.gomez@cbldf.org) by MIDNIGHT PACIFIC TIME July 10th to be eligible. You will be contacted immediately after the auction with any winning bids. We’ll be joining thousands of comics fans from around the world, and you’ll find us at booth 1918 with exclusive premiums, informative panels, the best party at Comic-Con, and an original art auction, all to benefit our important work defending the right to read comics!